Tanzania’s long Indian Ocean coastline, and the offshore islands of Zanzibar (Unguja) and Pemba, are home to rich marine ecosystems, including extensive coral reefs, important sites for sea turtles, whales and dolphins; and mangrove forests. The fisheries and other natural resources of the coastline also support the livelihoods of millions of Tanzanians and are critical to local and regional food security, as well as tourism businesses. 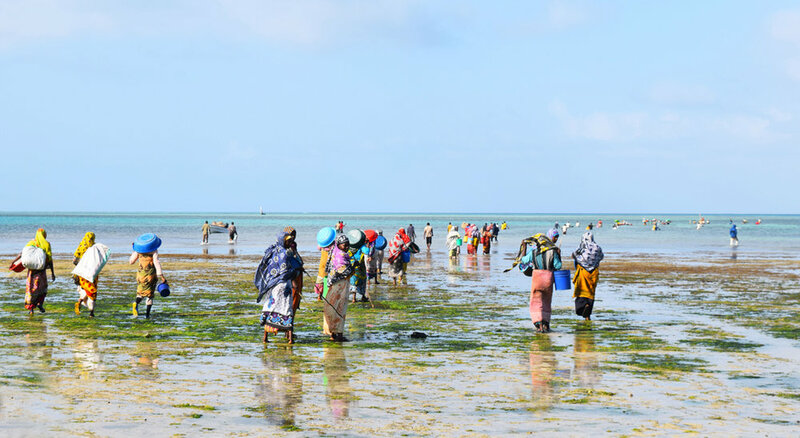 Mwambao Coastal Community Network helps Tanzanian communities to strengthening local man-agement systems and conservation practices for these marine resources. This includes developing local fisheries management committees establishing seasonal closures or fishing regulations to better manage high-value species such as octopus; and improving collaborative manage-ment with government, particularly in marine protected areas. Mwambao supports a growing network of coastal communities that can learn from each other through peer-to-peer exchange, and work together on shared interests such as fisheries policy and legal reform. Supported by the development of partnerships with Fauna and Flora International, Blue Ventures, the Indian Ocean Commission and other international groups, Mwambao is quickly developing into a leading grassroots organization in Tanzanian fisheries management and marine conservation. Area of the Pemba Channel Conservation Area. Its marine resources are vital for artisanal fishing and food security for 191,588 people, of whom more than 80% are fishers. Reduction of dynamite fishing blasts at 24 monitoring sites in coastal Tanzania from May 2016 to October 2017. Mwambao has successfully developed a local model for fisheries management using temporary octopus closures as an entry point where communities agree to ‘close’ their fishery for a three-month period. This allows fisheries to recover, and octopus are able to grow rapidly, reaching the size necessary for breeding and resulting also in a significantly larger harvest when fishing resumes. Many villages go on to repeat this regime every three months with only 2 or 3 days when the area is ‘open’. After starting with a pilot in 2015, these closure areas have rapidly expanded with villages on Pemba and Unguja adopting the model in order to improve local management practices. Villages are encouraged to capitalize on the success of these octopus closures to introduce more ambitious local fishery management measures. For example, in Kukuu village on Pemba Island, Mwambao has supported the community to establish a permanent no-take zone within a larger temporary fishery closure area. The management of this area is regulated through Kukuu’s local management plan, the first to be developed by a community in all of Zanzibar. Kukuu is also a part of the Pemba Channel Conservation Area (PECCA), where Mwambao is working to improve local fisheries management in this expansive marine protected area. This seascape of mangroves, seagrass beds, and coral reefs, is home to important populations of hawksbill turtles, tuna, and whales. A four-year project funded by the Darwin Initiative, which Mwambao is leading the implementation of, provides a critical oppor-tunity for Mwambao to take their work to a larger scale of impact. Tanzania is one of very few African countries where dynamite fishing is commonly practised. Mwambao has also been working with Sea Sense and WWF, using its local network structure, to address this incredibly destructive practice. The past two years have seen significant progress in combating this threat, as recent monitoring information collected by the group demonstrates.